I decided to document the rather odd process I go through anytime we are cooking for guests, and especially for holiday dinners. My last post outlined a bit of it. Basically, there are several lists. List one: Household chores that need to be done prior to the cooking. This list gets started two weeks ahead of the event. List two: the menu. Gotta know where you are headed. List three: The shopping list, one page, several days of errands, all on one sheet of paper. Don't lose this list. List four: All the recipes printed out (if possible) or gathered. List five: The chop list. This one takes all the various vegetables that are needed, quantity, type of chop, etc. and puts all the prep work together. Sounds odd, we all think of recipes one at a time. For big meals, it makes more sense to combine prep work. For example, the gratin and the green bean casserole both use two chopped shallots. On the list, put down one line item for four chopped shallots and do the prep all at once. It is also a great list in case you have kitchen help or a spouse that likes to chop. You can hand them the list and work on other items. And, yes, do all your chop and prep the day ahead even if you can't complete the recipe. You'll be amazed at how much easier it makes life the day of. List six: Yes, I know, I am anally-retentive. I said it. This one is important. The oven list. This list tells you what temperature the oven needs to work at, when each dish needs to go in (and out). The timing works backward from meal time. This list is important for everything to hit the table in sync. You can go a bit further and add the stove items and all the steps you have to do on the day of (in order) before meal time. It sounds crazy, but kids, there is a reason I got a rock solid A on my practical exam in culinary school. I had a list. One person, five dishes, 90 minutes. No special talent, just a list. I'll post the sample lists once the holiday is complete. Christmas dinner is coming, and I hear that's the best time of year to make lists and check them. I'll post the final menu and the lists for next Thanksgiving as well. By now, you menu is set and you are headed to bed to get some rest. Big day of pie making tomorrow. Have a wonderful holiday! Days before Thanksgiving. What's the plan? First things first, the bird needs a few days to thaw, unless you bought one "fresh," or chased the sucker around the back yard with a hatchet yourself. In the latter, case, I can't instruct you. I still have bad flashbacks from when my family butchered our own chickens [shudder]. Seriously, how do you manage the days ahead? I make a list. You can make the gratin ahead and some veggie dishes cover and store in baking dish (fridge), allow time to come to room temp before baking next day! Usually, you can make ahead stuffings and casserole-type dishes, rolls/bread, pies, etc. Review your recipes for baking times and temp. Schedule your oven time. Thanksgiving menu looking a little heavy on the calorie-meter? Here's a nice salad that offers a bright, light contrast to the usual feast yet still marries well with fall's classic dishes. Toss first 3 ingredients together, place over the greens. 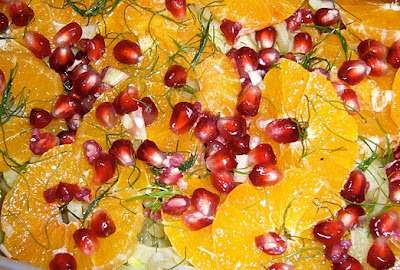 Dress with lemon vinaigrette. Step into my work office and ask me to reverse engineer a project and you are going to get The Look. The Look is the serious face, one eyebrow raised. The look is accompanied by The Line, "You know, it's a lot easier to just do it right the first time." I don't get as many visitors to my office this way. Still, reverse engineering has it's place especially when it comes to family dinners. Seems like a few folks at the table are adamant about certain dishes being on the menu, and others of us insist on trying new things. Not too many Thanksgiving dishes hold this honor as much as Green Bean Casserole. I will admit that I have never been excited about the mushy result of canned green beans, canned soup, canned crunchy onions, and cornflakes. The whole dish is like a tribute to the processed food industry. Let's un-process it, shall we? The final result will be crisp green beans, lots of mushroom goodness, fresh herbs, and a bread crumb, caramelized onion and Parmesan crust. It's good enough to make me forget all about any previous version. Blanch the green beans for 2 minutes, shock in ice bath immediately to stop cooking. Chop green beans into 1-2 inch pieces. Set in a layer in a 9x13 casserole dish. Heat the olive oil and butter in a large skillet. Add the shallot and saute for a couple minutes. Add the mushrooms and the thyme and saute until the mushrooms are softened and the shallot is golden, about 7 minutes. Add the flour and saute for another 2 minutes. Add the cream and stir to mix. Add the milk. Season with salt and pepper, cook on lower heat until thickened, about 10 minutes. Taste and adjust seasonings as desired. Pour over the green beans, tossing to coat. Spread into an even layer. Place the bread crumbs and Parmesan in a bowl and mix together. Add the onions and toss to coat evenly. Spread the onion and bread crumb layer evenly over the green beans. You can prep up to this point and refrigerate. Heat oven to 350 degrees. Bake casserole for 30 minutes or until bubbly and top is golden brown and crisp. Serve with the gratitude that you ate something real. Welcome to the Thanksgiving Traditions edition of the Carnival of Family Life. Pull up a chair and feast (menu here). As for my own memory of traditions, this year I will most certainly be thinking of my grandfather whom I lost earlier this year. He was in that Greatest Generation, having his childhood marked by The Great Depression and his early adulthood serving in World War II. He grew up as a devout Catholic in a struggling family with a lot of siblings. "Father, Son, Holy Ghost, whoever eats the fastest gets the most. Amen." Then he would laugh and wink. Indeed, tough times required a sense of humor, and, while we may be facing more of a Lesser Depression right now than the Great one, it's going to be a challenging season for us all. It's a time when counting blessings is even more important. If you have family and friends at your table, food on the table, and a secure roof over the table, then you are truly blessed. I wish each of you a happy and safe holiday, these simple blessings, and the hope that we can all remember others who are not as fortunate this season. And hope. I wish us all hope. Eat fast. Erin presents Keeping the Faith, Even in the Midst of Academic Struggles posted at School Psychologist Blog Files. Alvaro Fernandez presents Neuroplasticity and the Brain That Changes Itself posted at SharpBrains, saying, "Review of a great book with compelling tales about the amazing abilities of the brain to rewire, readjust and relearn." Rose presents Schools remind me why I homeschool - Learning at Home : Appeal-Democrat posted at Learning at Home. Annette Berlin presents Baked French Toast posted at Craft Stew. "Baked french toast makes a quick and easy Sunday morning breakfast," writes Annette. "It only takes ten minutes to prepare, leaving you free to spend the rest of the morning with your family." Chief Family Officer presents A typical lunch for the boys: Fried mac & cheese, chicken nuggets, grapes and a vanilla wafer posted at Chief Family Officer. Stephanie presents Pulling Off a Thanksgiving Feast posted at Make It From Scratch. Tiffany Washko presents Cheap and Easy Entertainment posted at The Attached Parent. Katey Magill presents Shaving Cream Bathtub Paint posted at Having Fun at Home, saying, "An inexpensive fun idea for the best bathtime ever!" HappyCampers presents Easy Homemade Gift Idea posted at The Adventures Of The Williams Family. This simple and cheap body scrub recipe was a big hit at Mother's Day when Laura and her son made it for their Mommy friends. "We plan to make another batch for Christmas gifts," she writes. MoneyNing presents Celebrating Thanksgiving is a Must This Year posted at Money Ning, saying, "Thanksgiving is one of the fun holidays of the year! No matter what, you should celebrate!" Joanne presents Make Stuff Your Kids Can Play With posted at Simply Saving, saying, "A variety of recipes for clay that you can make with your kids." Stephanie presents A Christmas Craft for Preschoolers posted at Stop the Ride!. Stephanie presents Mitten Gift Bag/Decoration posted at Make It From Scratch. AmyL presents Togetherness Crafts: Making a Unique Pillowcase posted at Earnest Parenting, saying, "Kids can be a big part of making their own pillowcases, from choosing fabrics to actually sewing them together. A quick and straightforward project to do together." Heather Levin presents How To Set Up A Community Lending Library posted at The Greenest Dollar. Polly Poorhouse presents 10 Cheap Things to Do With Kids posted at Economic Crunch. These days there is so much to do . . . with so little money. Polly offers some creative solutions. Super Saver presents Financial Lessons from my Parents' Generation Re-Learned posted at My Wealth Builder, saying, "The financial lessons my parents learned from the Great Depression were valuable during the financial crisis of 2008." Jim presents 0% Credit Cards: No Interest Purchases & Balance Transfers Offers posted at Blueprint for Financial Prosperity. Michael. presents The Jammie Thomas Case: RIAA Strikes Hard at Kazaa Users posted at International Law News, saying, "The RIAA wins a $222,000 lawsuit against a single mother of two for downloading music online. What do you think about this?" Matthew Paulson presents 5 Ways to Keep Even More of Your Cash and Get More Food posted at American Consumer News. Debt Freedom Fighter presents How Credit Rating Consequences Can Affect Your Life posted at Discover Debt Freedom!. Money Answer Guy presents Credit Card Mistakes You Should Avoid posted at The Money Answer Guy. DebbieDragon presents How to Recognize Offline and Online Money Scams posted at Debbie's Debt Advice. Trisha Wagner presents How Teens and Family Budgets CAN Coexist | Debt Free Destiny posted at Debt Free Destiny. Elizabeth presents A Son’s Epiphany and A Mother’s Lesson posted at Suburban Wife's Daily Dollar Diary, saying, "A son has his first financial epiphany and a mother learns a lesson about letting go." Silicon Valley Blogger presents Help Your Kids Get Rich: Invest Early posted at The Digerati Life. Hueina Su presents Celebrate National Family Caregivers Month posted at Intensive Care for the Nurturer's Soul, saying, "November is the National Family Caregivers Month, proclaimed by the President of the United States of America. As a life coach working with medical professionals and other Nurturers, I see the Self-Care Deficiency Syndrome reaching epidemic proportion. To avoid burnout, caregivers need to practice Intensive Self-Care, and I'm listing some great resources for them here." Donald Latumahina presents 9 Tips to Live an Abundant Life posted at Life Optimizer. freefrombroke presents 6 Ways Eating Out Less Has Made Our Family Better posted at Free From Broke, saying, "Eating at home have proved to have many benefits to our family." Carole Fogarty presents 14 Funky Ways To Calm Your Nerves Consistently: posted at THE HEALTHY LIVING LOUNGE, saying, "Do yourself a favor and add more deliberate moments of relaxation and deep rest into your day. This article is a reminder of the many ways you can put yourself first more often and soothe your nerves consistently. You can also tell where my focus is at the moment ……. nourishing my nervous system." Patricia Turner presents Top 50 Green Technology Blogs posted at Green Web Hosting Blog. Aahz presents Dad Gets Girly With Sparkly Nail Polish posted at Philaahzophy, saying, "Who taught YOU to paint your nails?" Loren Christie presents Consequences Are Very Not Fun posted at Dude, Where Am , saying, "Raising small children is the most comical time of your life. Don't adopt a beagle." Riley presents The Post of Christmas Past posted at All Rileyed Up. makingthishome presents Revealing a Few Secrets You Didn?t Know posted at Making This Home, saying, "Here's a salute to my translator to share." Nards presents Song of the day: Can You Feel The Love Tonight? - Elton John posted at Nardeeisms. Laurie Bluedorn presents Reminder about the Pie Auction/Barn Dance Fund Raiser for Greg Wallace posted at Laurie Bluedorn. Jennifer in OR presents Sleepover with an 84 year old friend posted at Diary of 1. Wendy Rae presents Raising Spiritual Children posted at Spiritual Life Design. Shannon Hurst Lane presents Family Holiday Fun in Branson posted at Traveling Mamas. Matthew Paulson presents Traveling to Florida’s Space Coast » The Travel Advocate posted at The Travel Advocate. Joe presents Kids GPS Phone: A Brief Introduction posted at GPS Tracking Watches, saying, "Cell phones have made their way into even the smallest hands in our families. Now these kids cell phones are coming equipped with GPS technology as cellular providers seek to attract more parents to buying these types of plans. This post attempts to educate consumers on what makes this technology work." Khan presents Working Parents and Children | Effects - Problems posted at Higher Education and Career Blog, saying, "Millions of parents struggle each year to balance career and childcare. Fortunately, more options exist for working parents than ever before. If you want to find a solution that satisfies your family and your employer, read on." Thank you all for participating in and supporting this edition of the Carnival! Next week, the very special Thankfulness Edition of the Carnival will be hosted by Hopeful Spirit at On the Horizon. If you would like to participate in next week's edition of the Carnival, click here to submit the link to and relevant information about your posts. Note that for the Thankfulness Edition, two posts per blog will be accepted, so long as at least one of the posts focuses upon Thanksgiving, gratitude, celebrating one's blessings or a similar theme. If you have questions, be sure to review the Carnival guidelines before submitting your posts. For everyone visiting, I am hosting this week's Carnival of Family Life. The topic is on your holiday traditions, can be humorous or heartwarming, green holiday tips or just sharing a memory. Share your holiday with us! Send submissions to Blog Carnival. I made a hopeful plea that perhaps, with the new administration, I would have good news to blog about instead of always down in the muck with rake in hand. It's promising that with Obama still not even in office, there are some bright spots on the horizon. Obama considers Robert F. Kennedy to head up the EPA. Imagine, an environmental activist someone who CARES about the environment heading up an agency named "Environmental Protection" Agency. It's just so ... logical. So right. Maybe this will mean reversal of the recent CAFO rule that allows a feedlot to pretty much "self-regulate" with regard to pollution and emissions. Among other atrocities of the last eight years ... here, here, here. A positive sign is the announced intent of the Obama administration to immediately reverse many of the Bush administration's anti-environment policies (among others). A different kind of stimulus package is put forward. I'm a big advocate of food justice, so when I read that Obama's plan would extend food stamps and unemployment benefits, I can see how this measure would help the people who were hurt most in the "Trickle Down" where none of the obscene profits trickled, but, boy, the problems sure came down like a flood. The other piece is using the money to help create jobs. Kind of makes sense, huh? More jobs, less unemployment. A lot more than sending us all a check (even the wealthy) so we can go out and buy $600 worth of stuff MADE IN CHINA. I know, I know, Christmas is coming and that money would have helped. Still, I'd rather know people have a roof over their heads, even if it means I have less under my tree. Call me a socialist if you will, but even the Grinch figured out that Christmas doesn't come from the store. We can, too. As far as the new administration hearing the call for change, well, apparently Obama has read the open letter to the "Farmer-in-Chief" written by Michael Pollan. Cool. Wow. It's nice to post good thoughts. I hope there's more where this came from! 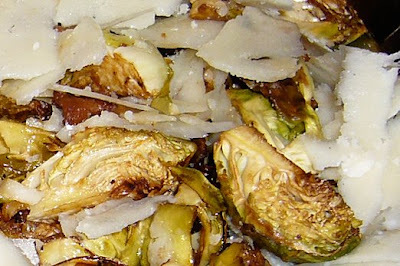 Chestnuts, Apples, Sage, Bacon and ... Brussel Sprouts? Or, how not to be a good hostess. Want a sure fire way to fail at entertaining? C'mon over to my house for a lesson. First, you don't bother to dress for the occasion. Flannel shirts are okay. Maybe, you don't even have time to shower. No problem. Don't set the table. When you do, use mixed and matched plates from three different sets. Call it eclectic. When you ask your guests if they would like something to drink, list the options available. When they choose, give them instructions on where they can help themselves to it. Drink lots of wine. Ignore silly low carb diets. SERVE BRUSSELS SPROUTS TO THEIR KIDS. AND LOTS OF VEGETABLES. If they come back again, then you know they are friends you want to keep. Actually, our guests did enjoy helping with an annual ravioli fest. It's a lot of work, home made ravioli, so we usually do this as an "interactive dinner." Yep, hands on for the guests, too. The kids actually loved this, especially using the pasta roller and the ravioli mold. A few tips if you plan on hosting a similar, uh, event. Have the pasta dough ready, it needs to rest a half hour before rolling. Have the fillings ready and the tools and a clean work surface prepared. Put out easy snacks so guests can take a break and have a quick bite until dinner. Serve alcohol to the adults. Don't worry about the mess, or if things aren't perfect. It's about preparing a meal together and having fun. Have a one-pot dinner course in the oven and soup for a first course ready. This helps keep all the activity centered on just the one dish to prepare together and a quick sauce for it. If you serve any other sides, keep them simple to prepare, or prepared in advance. Preheat the oven to 350 degrees, roast setting, if you have convection oven, or 400 degrees for a regular oven. Toss the sprouts with olive oil and balsamic. Place in a single layer on a baking sheet. Roast for about 15-20 minutes until they start to show some golden brown (the balsamic will make it harder to tell what's roasted and what's vinegar). Go for lots of golden brown, you may have to stir once during roasting. When the sprouts are about two minutes away from done, add the pine nuts to toast them. Remove from oven and place on a platter when done. While the sprouts are getting crispy, cook the bacon in a skillet until almost done. Pour off all but one tbsp. of the grease. Add the shallot and finish cooking the bacon and shallot until browned and done. Remove from stove, whisk in olive oil and red wine vinegar. Salt and pepper to taste. Drizzle the dressing over the sprouts. Top with the shavings of Pecorino. Sit back and watch perceptions of Brussels Sprouts (including my own) shift. 1 recipe pasta dough (I use the recipe in Lidia Bastianich's cookbooks), or you can use wonton wrappers if you don't want to make the dough. 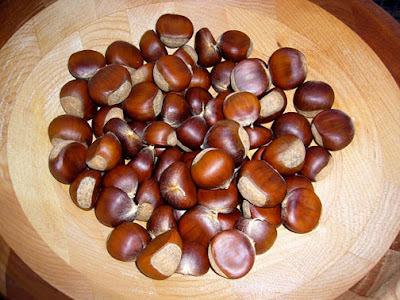 If you are roasting the chestnuts yourself, cut a large "x" in each one, place on a baking sheet. Cover with foil and roast at 375 for about 40 minutes. Peel the chestnuts while still warm. Or, best of all, have your spouse do this part! Saute 1/4 of the bacon in a skillet until halfway cooked, pour off all but a tablespoon of grease. Add half the diced apple and the onion and cook until bacon is crisp and the apple and onion are golden. Transfer to the work bowl of a food processor. Add the chestnuts, nutmeg and the marscapone. Salt and pepper to taste (pinch). Pulse until it forms a paste and is well combined. Fill the ravioli (we used a ravioli mold, this is great), using the egg wash to seal the dough. About 1-2 tsp. filling for each. 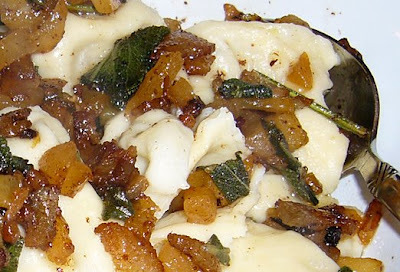 Set the ravioli on a baking sheet with floured parchment. Make the sauce, heat a skillet, cook the remaining bacon until half done, pour off all but one tablespoon of grease, add the other half of the diced apple and sage. Salt and pepper to taste. Cook the ravioli in boiling salted water for about three minutes, or until each ravioli floats up to the top. Sprinkle the "sauce" on the ravioli and serve. Goes great with prosecco. Ignore the kitchen full of dishes until after dinner. Don't make guests help clean up. You have to be somewhat of a hostess, after all. "What are doing, Kiddo? The cookies are not cooled yet." "I'm just watching them to make sure they don't move." "Okay, make sure they don't move into your mouth, deal?" There are a few sacred recipes that I have hesitated to "recreate." As much as I love pumpkin (and have them lying around) you would think I would have gotten around to new recipes for old favorites. Perhaps it's the fear of disappointment, that the new recipe won't be as good. Or, really, that I am not that good if I can't make a better version. When I was very young, my favorite cookie was not chocolate chip. My mom was not an enthusiastic cook, being the 70s and a working, single mom. Packaged foods were normal fare. But, every now and then, she would make these awesome cookies. 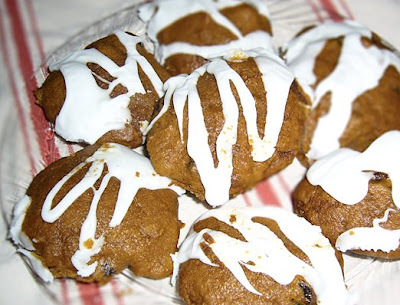 Pumpkin with raisins. They were cakey, and moist, a bit spicy. I never had the recipe, and just now, some 35 years later, I am getting around to making a recipe of my own. I added a couple things like black strap molasses and an icing. I was not disappointed. Mix the dry ingredients flour, salt, baking powder, spices together in a separate bowl. Cream the butter, molasses, brown sugar, egg and vanilla together. Add the pumpkin. Stir in the dry ingredients until blended well, but avoid overmixing. I know, it's vague, but just don't beat the hell out of the batter. Fold in the raisins. Spoon onto the cookie sheet and bake for about 12-14 minutes depending on your oven. Allow to cool and prepare glaze. Blend to glaze consistency. Drizzle over cooled cookies. Now, the pumpkin pie (my other longstanding favorite) is still a work in progress, but I really like the version I worked on over the weekend. 1 unbaked 9-inch deep-dish pie shell or your own crust. Mix the dry ingredients, sugar, salt, spices. Beat the eggs, stir in the honey and pumpkin. Stir in the dry ingredients. Slowly stir in the evaporated milk. Pour into pie crust. Bake for 15 minutes, reduce oven temperature to 350 and continue to bake for 45 minutes more. Cool and store in refrigerator. Serve with whipped cream. Wondering where a recipe link is from the last year? I have been very bad and not updated the recipe index. Here's everything from Nov. 2007 until now. Note, these are ORIGINAL, COPYRIGHTED RECIPES that belong to me. Enjoy the cooking, let me know how the recipes worked, but please, respect the copyright. And, yes, I really do cook this much in a year. More. Leery of the leek? Afraid of asparagus? Broccoli your Boggart? You are not alone. According to a 2007 study published in the American Journal of Medicine, fewer than a third of us eat enough fruits and vegetables daily. Perhaps it’s time we faced our deep-rooted vegephobic fears? Here are my "Top Five" I have overcome. I clearly recall making little towers of canned, pickled beet cubes. I don’t remember eating them more than once. It was a long, long time before I faced down a beet again as an adult. As my first season participating in the Eat Local Challenge and as a member of a CSA, I felt compelled to cook whatever came in the weekly box in whatever way I could to make it palatable. What I found out was, they are pretty good. That, indeed, everything not in a can tastes a whole lot different. Beets are especially good roasted and especially good for you as they are rich in the same anthocyanin compounds like wine and berries. I was first traumatized introduced to this mushy, awful, bitter canned spear that smelled, well, a bit like pee. Shudder. As a general vegetable rule, avoid the can. The same is true for green beans and most vegetables. If you don’t like them, you’ve likely never had the real thing. Fresh. In season. Real. No comparison. I must admit, canned green beans do have a fond place in my childhood memories, looking across the table to see my brother having stuffed one up his nose with the end hanging out to make me laugh. Ah, family memories. Asparagus are a great source of folate, potassium and inulin fiber. My first exposure to greens was when I was working at a rest home in high school. One of the residents, with no teeth, bolted down a serving and I had to step in to perform the Heimlich. It’s been over 20 years, and I am just now brave enough to cook greens. 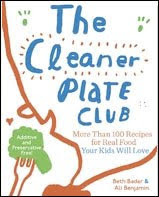 And I would never have attempted it if I hadn’t learned that greens pack a huge nutrition load of vitamin C, folate, fiber, iron, minerals, beta carotene, antioxidants and cancer-fighting phytonutrients. A few caveats if you want to try greens. The more you overcook them, the more bitter they get. Saute lightly with garlic and bacon for a treat. Or try kale with garlic, white beans and red pepper, topped with grated parmesean. Taking the lighter approach with greens has even helped me recover from the black, mushy, cider-vinegar soaked mess of spinach I had to eat as a child. You can even get “free” bonus greens at the top of your beets. Free is good. Therapy is expensive. We hid them in napkins, stuffed our cheeks full and spit them out in the toilet, even tried to feed them to the family dog — if the dog would eat them. Try as we might, peas just never went down easy even when my siblings and I swallowed them whole. We won’t mention that scene from The Exorcist, either, even if it was just Halloween. 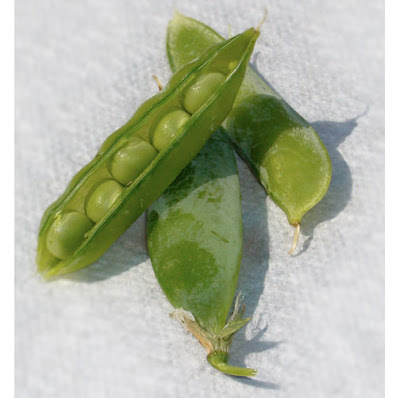 I have found that I will eat peas raw these days, fresh from the pod. Or, early season and barely warmed. Even top quality frozen peas aren’t too awful. But, I must admit, that peas are best mixed in dishes like a hearty stew or a pasta dish with white sauce, bacon and peas. Peas and I have a way to go, but I’m working on it. Snow peas and sugar snap peas are good alternatives. Your mom wasn’t completely evil by putting peas on the plate. They are an excellent source of Vitamins K and C, folic acid and B vitamins, plus protein and fiber. Number 1: Even covered in cheese sauce, you still can’t deny it. The Dreaded One. Broccoli. Indeed, broccoli may be one of the few vegetables that we can be genetically predisposed to dislike. Have faith. 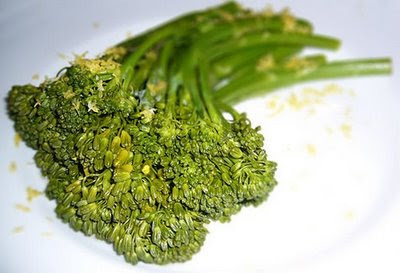 With a good recipe, or by substituting the sweeter cousin broccolini, we shall overcome. No Velveeta required. Broccoli tops the chart on the health-o-meter not just as an excellent source of vitamins, fiber and minerals, but also because it contains phytonutrients with anti-cancer properties and even calcium for strong bones. Just think of the cheese sauce as extra calcium. There now. That wasn’t so bad, was it? Ready for dessert? That done, if you are still in a voting mode, you could keep me in mind for the 2008 Weblog Awards coming up this month! Best Food Site. Maybe 2008 is my year, too! Sign. Sign. Everywhere a Sign. I am finding it hard to work. Hard to keep my mind off Greater Things. On my way to work, a homeless man had taken up his post at the corner of the overpass, at a stop light. I paused, having only a few seconds before the light would change. Do I give him money? How can I be sure he will use it for food, that he is really homeless? Does it matter, he's in worse shape than I am either way. He's holding a sign, simply, "Please help. God Bless." The other hand is holding a sign as well, two fingers in a "V." Peace. I have just moments now. As Jen has taught me in her posts, the thing beyond money that this person may need is to be seen. To be recognized as a fellow person. I look him in the eye, I flash back a peace sign. It's all I can do. He smiles, a big open grin. Our eyes meet. Is that a flash of something there? Is it just because today is the day before a momentous election, could it be, a glimmer of hope in both of us. A shared moment where we think about better times being possible. I'm saying yes. I am taking it as a sign. I will admit that I won't stop writing about the politics that impact our food supply and safety even if the election goes as I hope. It will take time to change agencies like the FDA and USDA and regulations. I just hope that this time around, after tomorrow, someone will hear my call for action. And change will come. That I can write posts that shout to the hills the good things that are being done. I am awarding an October Perfect Post to the ladies at the Green Phonebooth for this brief profile of Eleanor Roosevelt. It's a timely reminder that a first lady can be far, far more than a human rack for designer clothes, a social event hostess, or one who bakes cookies and fades into the background so as not to get in the way. Few first ladies have had such an impact on Americans as Eleanor Roosevelt. And, as we stand ready to elect our next president, perhaps we should contemplate on which "other half" may be the best example for our nation as well. "Perfect Post is a post that made you cry, touched your heart, had you laughing out loud or made you believe in magic again. Whatever the word perfect means to you," according to the award authors, MommaK at Petroville and Lindsay at Suburban Turmoil.